ITN Converter (a.k.a. ITNConv) is both a route converter supporting many formats as well as a simple and efficient route planner. 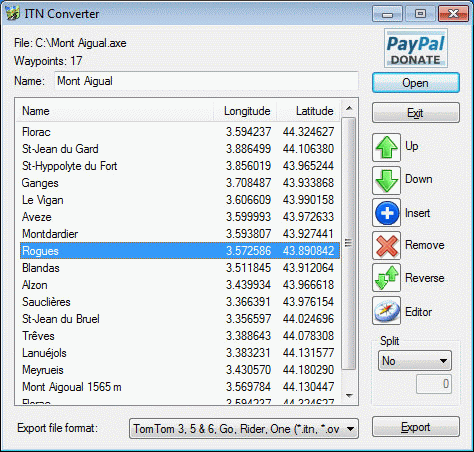 The converter supports route file formats (roadbook) from many GPS or mapping software such as TomTom, Navigon, Garmin, MapPoint or MapSource. This converter can easily transfer a route created by a GPS or mapping software to another so you can download routes from many web sites and convert it to the file format supported by your hardware. How to extract: Download the "Travel version" ZIP package and extract to a folder of your choice. Launch ITNConv.exe. From the articles I found, Internet Explorer 10 cannot be installed on the Windows Vista OS. @John It says it right there where you write your comment, above the textbox: "If your *** scanner has detected a virus in the application, please email the author directly or post to the forum. ....."
You should report the false positive to Norton.